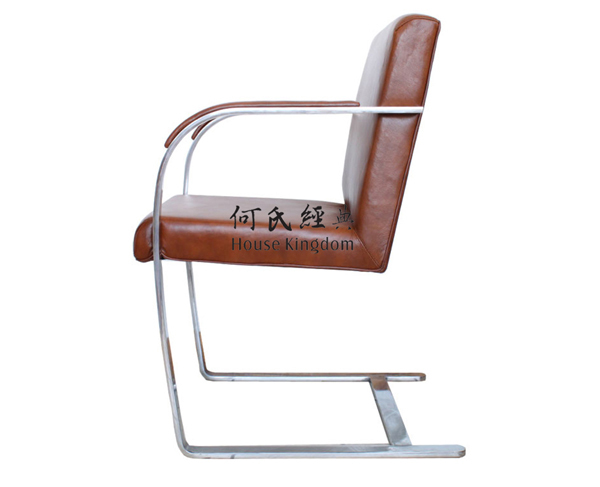 The Brno chair (model number MR50) is a modernist cantilever chair designed by Ludwig Mies van der Rohe and Lilly Reich in 1929-1930 for the bedroom of the Tugendhat House in Brno, Czech Republic. The design was based on similar chairs created by Mies van der Rohe also working with Lilly Reich, such as the MR20 chair with wicker seat from 1927; all building on earlier designs of Mart Stam. The Brno chair has become a modern furniture classic. It has very clean lines, consisting of a steel frame in a single piece, bent into a C-shape from the middle of the back, round past the front edge of seat (to create arms), and back under the seat to create a cantilever, with taut seat and back upholstered in leather. 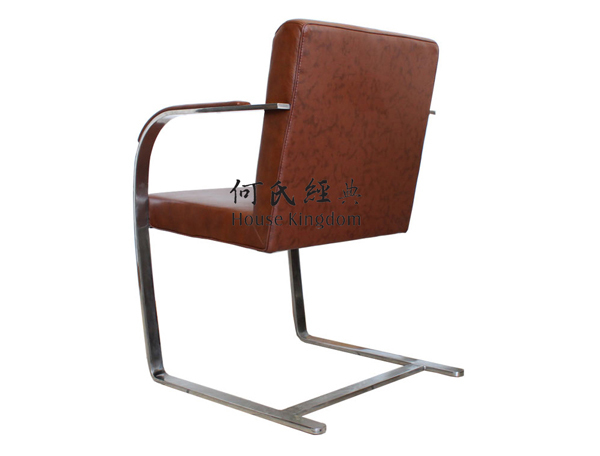 There are two versions of the chair, one in tubular steel and the other in flat steel. The metal was originally polished stainless steel; some modern examples are chrome plated. The Brno chair was selected by Dan Cruickshank as one of his 80 man-made "treasures" in the 2005 BBC series, Around the World in 80 Treasures. 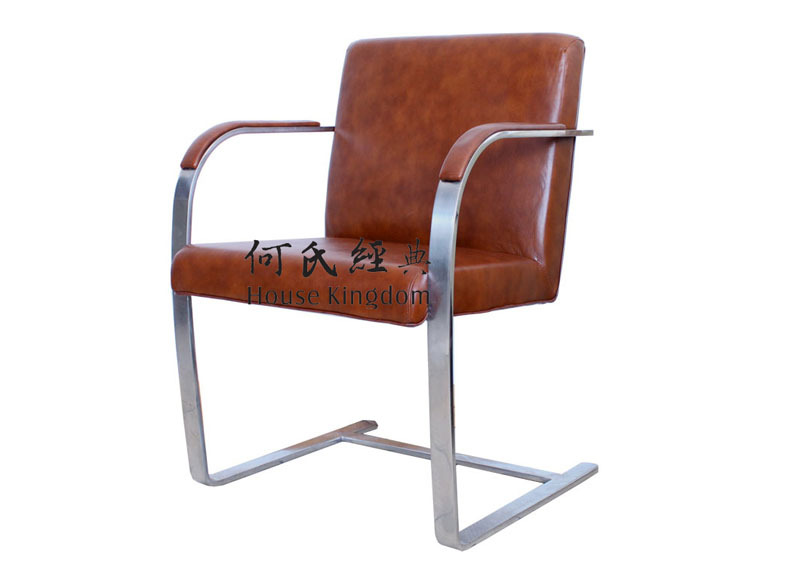 - The solid Flat Bar Brno Chair was designed by German architect Ludwig Mies van der Rohe, Villa Tugendhat in Brno, Czech Republic, is one of the Europe’s pioneering prototypes of modern architecture. The Ludwig Mies van der Rohe's Brno Chair is an icon of 20th-Century design. - Features same as to original, 1 single piece Heat tempered and bent C frame geometry. - Premium SUS304# Grade Stainless Steel Frame; The base cross bar joints of the stainless steel frame have been ground, sanded and sealed. - Solid Flat Bar Frame with high mirror polish. - Our replica Flat Bar Brno Chair upholstered in Black Full grain Italian Leather. - CA-117 fire retardant High Density Highly Resilient Polyurethane cushions. 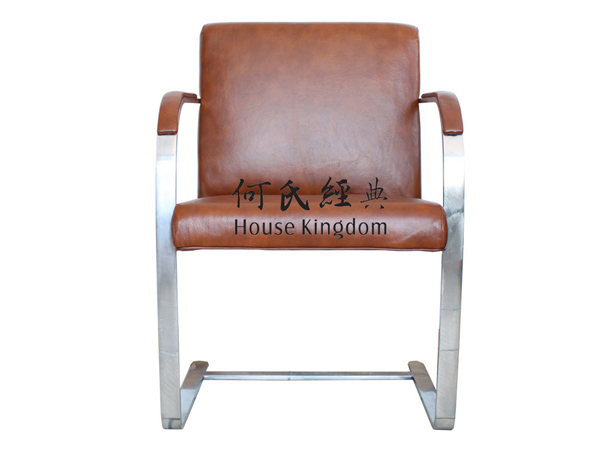 - Leather cushioned armrest pads with low profile counter sunk screws attached under the flat-bar arms. - Available with High Quality Italian Leather in wide variety of colors. - The replica Flat Bar Brno Chair is also offered in a Tubular frame version. - The Replica Flat Bar Brno Chair, with its compact and incredibly comfortable design, makes for a lovely addition in any office or commercial setting.